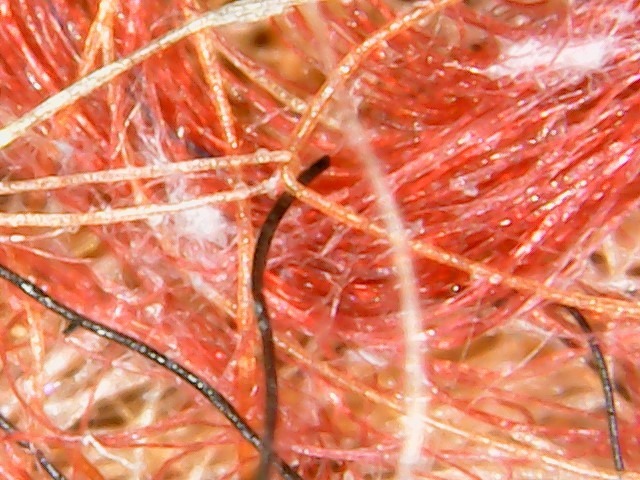 Let’s get up close with some wool, silk, and mohair Nuno felt fibers. Really, really close. 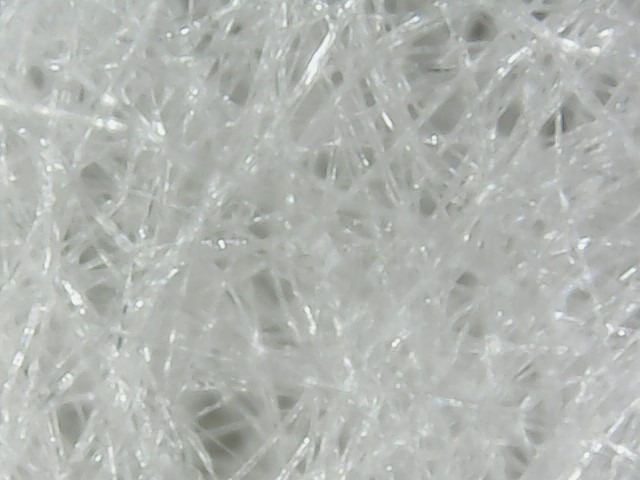 I always wanted to see the difference between types of fiber under a microscope, and got a chance today. You see, I live with a science teacher and I decided a few weeks ago that he really needed a microscope with a usb to hook up to his computer. He could show gross things to middle schoolers on the projection screen!. I got him one for his birthday and the kids loved it. Today, he left it at home. Hah! It was MY turn to play with his birthday present. Here’s a link to one just like it from Amazon. I paid more than this, but it’s too late now. At this price, get one for everyone in the house! This was made with two thin layers of black-dyed Merino wool with silk fabric, Mawata silk “hankies,” silk fibers, and kid mohair locks added on top of the wool. I love black wool under bright colors with this technique. Nuno is a wet-felting process, with hot water and soap, along with a LOT of carefully controlled agitation. 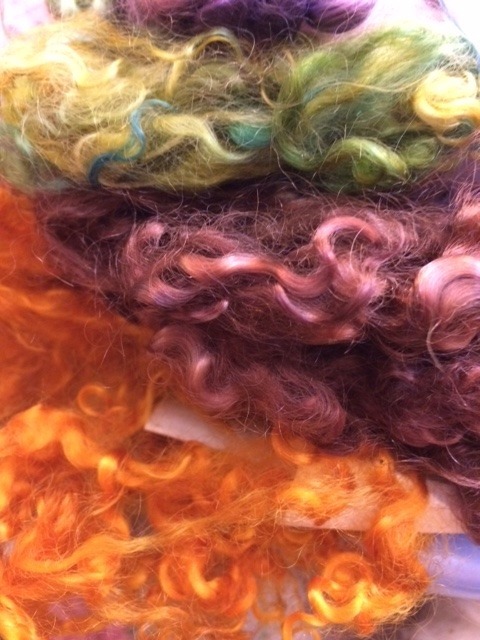 The goal is to get the wool fibers to grab through the layers of silk, and then to shrink and bond in the felting process. Just like the wool sweater you accidently put through the regular wash load, it shrinks and gets thicker. Using my guy’s new birthday present, I checked it out up close, and took a lot of photos. 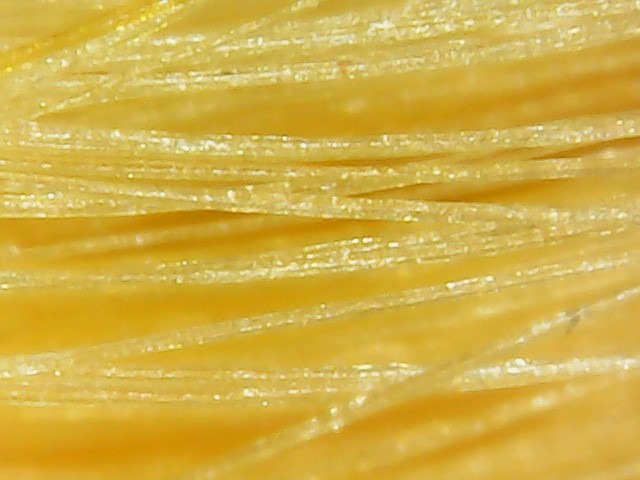 Try to guess what each fiber is before reading my description below the picture! 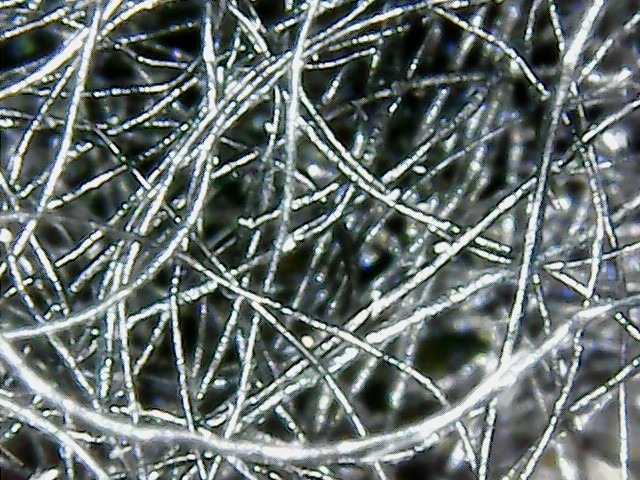 The “magic” fiber underlying the felt structure, these black dyed Merino wool fibers show just a little bit of their scales on the surface, which tangle and bond together after the felting process. Silk gauze woven fabric after felting. It is no longer smooth, but puckered and held in place by those few black Merino fibers you can see here. 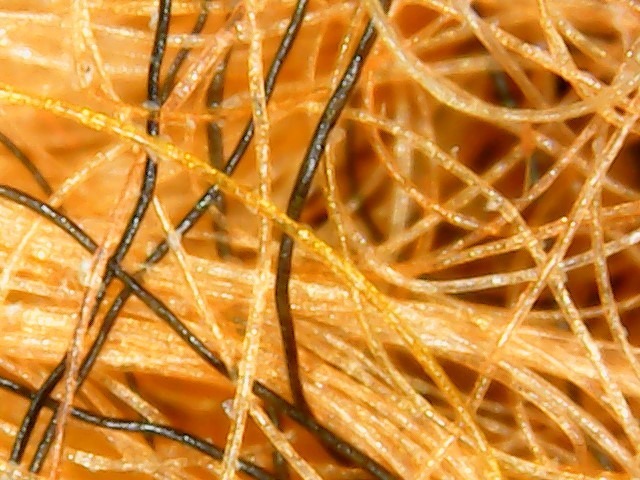 Bombyx silk (which is the type of silk created by silkworms eating a diet consisting solely of Mulberry leaves.) This is undyed, before felting, from a silk “cap,” sometimes known as Mawata silk. It is made from many layers of cleaned and expanded silk cocoons. So, you’ve seen the basic fibers I used in the felt. Now, let’s take a look at them after felting! I love this shot. 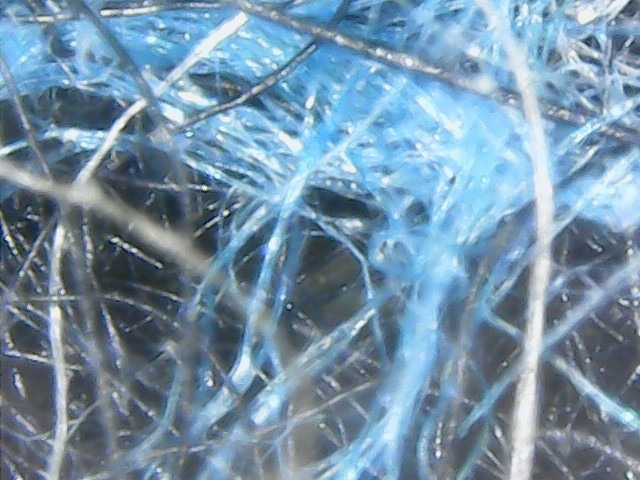 See the two mohair fibers hooked together right in the middle? You can see that the black Merino wool is rougher and crimped, and how it weaves itself in and out of the smoother silk. That smooth mohair resists felting. You can often see a lock rebelling against the felt and popping out, at least on one end, its little curls waving in the air. 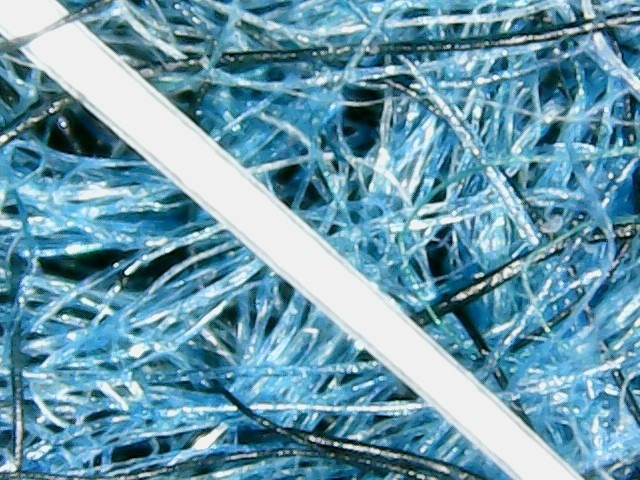 The fibers are thicker and stiffer than silk, so it’s harder for the wool to grab it and tie it down. 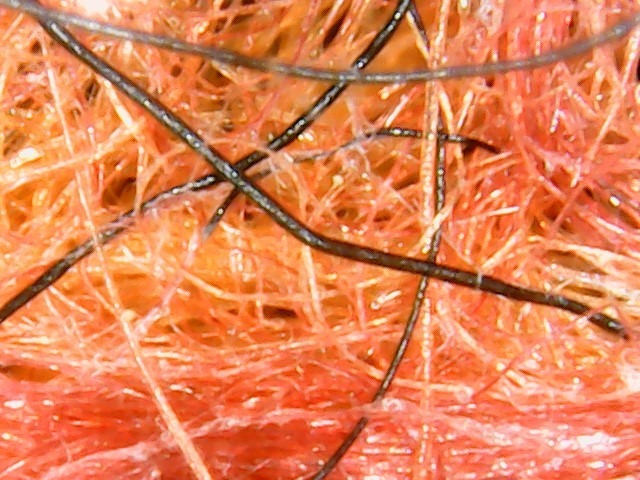 The wool has more variety in thickness than the silk. It’s really grabbing on to this teal silk, which was from a stretched out dyed silk cap. Whoa! What do you think that monster is? Hehe. 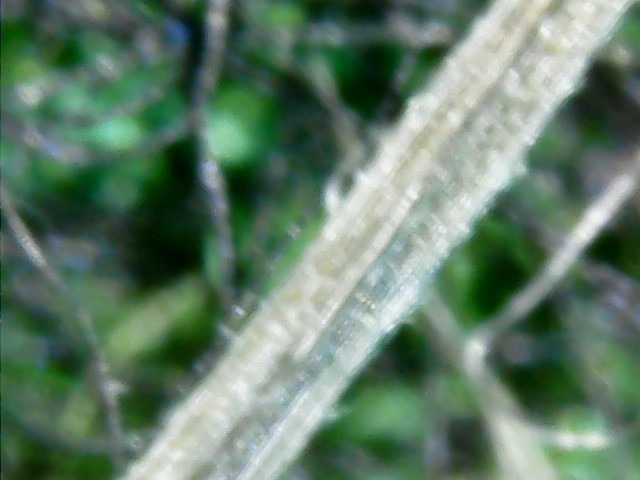 People who pick out “VM” from wool fleeces for their spinning or felting might recognize this tenacious little bit of grass which survived washing, picking, carding, dyeing, and felting to show up here under the microscope. My last micro-picture shows that my artwork does NOT come from a pet-free environment. 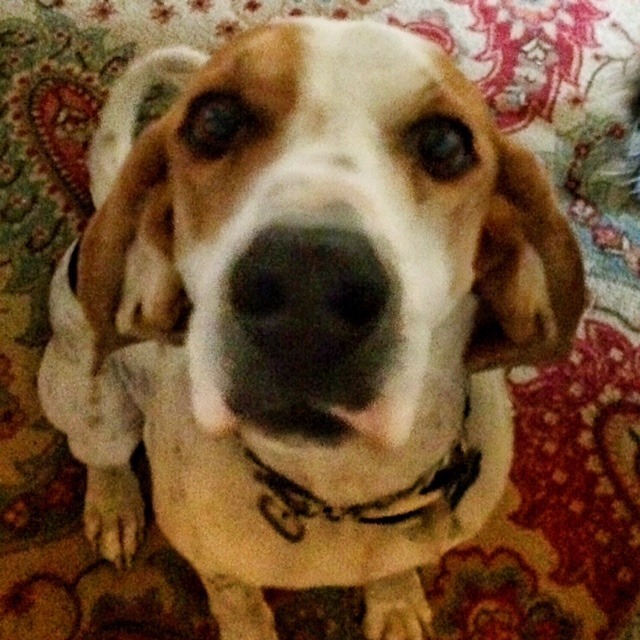 Can you spot the Hound Hair in this picture? I hope you found this as interesting as I did! 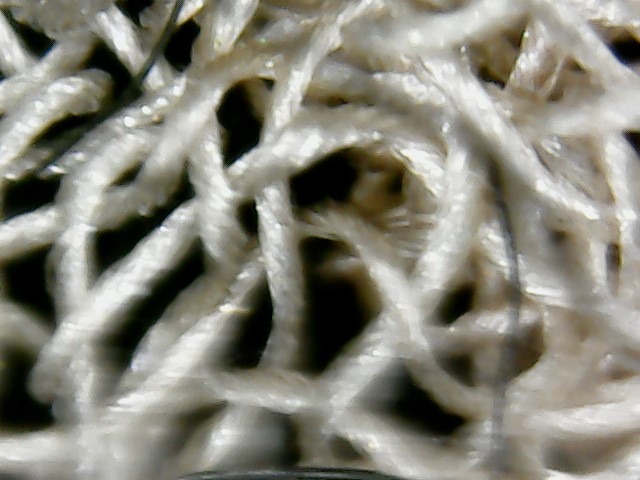 It was a surprise to me that the scales on the wool weren’t more obvious under magnification, since I know that they are responsible for the magic of felt. 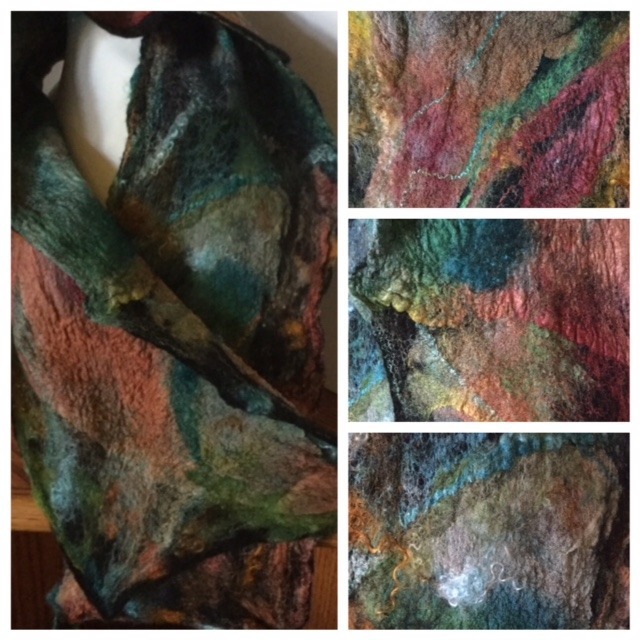 I love the translucence of the silk fibers, and the way the colors showed throughout each fiber on the dyed silk. And check out this microscope! Who knows what you can find to examine up close!